Two New Bible Studies beginning SOON! on Tuesdays from 2:00 to 3:30 p.m.
​Leslie J. Hoppe, OFM, is an adjunct professor at Catholic Theological Union after serving on its faculty for twenty-four years, and serves as the provincial minister of the Assumption Province Franciscans. He has written several books on biblical studies and archaeology, including The Holy City: Jerusalem in the Theology of the Old Testament (Liturgical Press, 2000). He is a former editor of The Bible Today and currently serves on its editorial board. 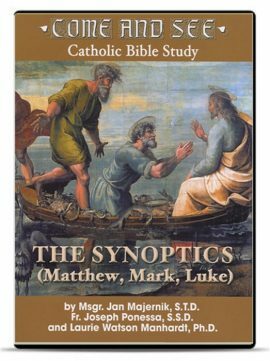 This Bible Study considers the life and ministry of Jesus of Nazareth through the Gospels of Matthew, Mark and Luke (called the Synoptic Gospels because of their similarities). Their accounts can be placed alongside each other to compare events in Christ's life. We will focus directly on the beauty of God's Word expressed in the theological outlook of the final text of each Synoptic Gospel transmitted to us from the Tradition of the Church. Because of the vast material contained in these Gospels, the study will focus on themes in the life of our Lord Jesus Christ, from the preparation for His birth and public teaching to His Passion, death and Resurrection. Further emphasis is placed on the traditional interpretation of the early Church Fathers to show how the text was understood in the early Church and matured throughout the Church's history. Key topics will be outlined and studied in light of the Old Testament tradition, along with the archaeological discoveries and geographical backgrounds. Selected passages of the Gospels will be viewed in light of the Church's teaching summarized in the Catechism of the Catholic Church. For those of you who have studied each of the Synoptic Gospels separately, this study will allow you to examine the similarities and differences in the way key themes are treated by these Gospel writers. There are twenty-two lessons in this Bible Study. The first session (September 4th-November 13) will cover lessons 1-11. The second session (February 5-April 16) will cover lessons 12-22. It is not necessary to do both sessions; but, it is recommended if you must choose one or the other begin with the first session. The study guide is set up so you may finish the second session as an individual/independent study. The cost of the study guide is $25.00 and is used for both sessions. This cost is the equivalent of materials for study guides for two separate six week studies. St. Veronica Bible Study groups meet to share faith & prayer, study a particular theme in faith or scripture and enjoy one another's company. All meetings are in the Parish Ministry Center.